Born in Timisoara on 08/06/1991. His passion for music started when he was a small child. He grew up on the music of artists like Daft Punk, ATB, Fatboy Slim., Deep Dish. The first party that felt the vibration of electronic music was at Liberty Parade 2005, then received a big motivation for starting a career in music. At 16he had the first contact with the dj booth. He reached to mix at various private parties, events, club `s.
In 2010 he started the radio show (Cys), such as MaxFm, Posh Radio, Minimal Freaks and many other guest mixes on FM and online radios. The year 2011 started well for Ravelli, joining the team AfterNight Events, mixing with the team at club Play Ane Timisoara (Calea Arad, No. 48). 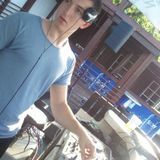 Summer of the year 2011, broughtRavelli to another level, you could hear him live atSun Beach Club, NoNameTimisoara, where he was resident for 2 months.